EXTENDED: 2017 Creator 2.0 Thanksgiving Game Jam (Win PRO)! — Welcome to the GameSalad forum! Are you getting ready to inhale insanely large quantities of food? Have you decided to jump the gun and start feasting early even though the rest of your family has yet to show up? Perhaps you’ve already hit the dreaded food coma. Or maybe you’re attempting to be "healthy" and not intake 10,000 calories in a single sitting. Whichever state you’re in, I wish you the best of luck as you travel the long road to recovery. 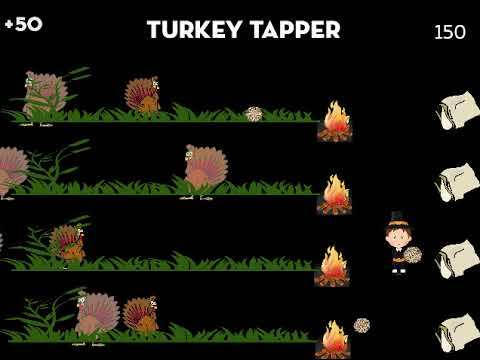 The 2017 Thanksgiving Game Jam! Some of you seasoned veterans may remember the other Thanksgiving Jams we’ve done in the past. For those of you who have joined the community since then, you’re in for a treat! Interpret this how ever you want and go wild! Creativity is always a plus! The winner of the Game Jam will receive 1 MONTH OF GAMESALAD PRO! Also, everyone who participates in the competition will be awarded with a special forum badge commemorating the Jam! Build your game with our new web platform, GameSalad Creator 2.0! We’ll be pushing a new update filled with lots of great stuff next week; we think you'll really enjoy it! Games not developed in Creator 2.0 will not be considered as an entry. Publish your game to the GameSalad Arcade and submit your game for the contest by posting the link here to for all to play! Feel free to spice up the submission and post descriptions and screenshots as well! One game submission per person. Make sure you submit your entry before the deadline! We're looking forward to seeing the creativity from our community! Best of luck to all, and again, Happy Thanksgiving! Sounds like fun. Have idea. Starting on some art today. If the deadline is November 30th 2018 count me in it! I can't come in because my MAC is on High Sierra and my Pro membership is worthless. An additional month (if I'm the winner) is worthless too because I can't use Gamesalad on my MAC (High Sierra)! You don't need the native tools to enter this competition. You need to use our new web tool to develop the game. The link is up above. We are still working on fixes for High Sierra compatibility. We've got a beta build right now that (outside of 1 display issue) is fully functional, and you can download it via the link below for short-time use until the final build is released. Thanks for your patience as we continue to work on these fixes, and I hope to see your entry for the competition! What scene size should we be using? Doesn't matter. Whatever your game requires. The default is iPad but you can change it if needed. Hey getting close to wrapping up a game, how can I copy scene in this version of gamesalad? It says it copied the ''items'' but it will not paste. Any help? Been working on my game, too. I was hoping you gave up! @Toque Haha! I did say that, didn't I? My son walked by and said, "aren't you going to work on your game" and I couldn't let him down. Plus my inspiration, a 1983 Midway game, is just too good to leave alone. You are as stubborn as I.
I have a strong suspicion of the game your thinking of. Funny my inspiration came from 1978. I hope there are a few around here that will get it. Poke........ @jamie_c Guru. Havnt shaved since the start. Not until I’m done. @Toque What happened to your beanie avatar? Have you been demoted as punishment for being so vocal lately? Maybe the Forum is even broken now. Years of funny posts, jokes, wise-arse* remarks, b....ing and m...ing may all disapper now! Hey if I win can I save the pro month since I already have it going? Can I give it to somone else? I have found the icons appearance to be sporadic at best. Not sure if its a browser thing or GS thing? Not just mine but others as well. By the way we don't use beanies in Canada they are toques. Made of wool or a dead animal. hmmm looking at the posts it does appear than mine is the only avatar missing today........ run for the hills. I uploaded a new image. Will see. How embarrassing when I win the Jam and don't even have a avatar picture!!!! O oh! No scene copy and paste? I should of checked that five days ago. Would of designed a one scene game.......That is going to hurt. Wait there are live updates. Checking now! Don't need no stinking copy and paste scene function. On his hands and knees slowly moving closer to the river. He passes the skeletal remains of @tatiang and @Twain2. But falls in to a hole where once scene copy and paste used to be. Just because I've died doesn't mean I can't still compete. Ghost Turkey is almost completed. And it's... wait for it... a ONE SCENE game. One scene. Smart @twayne2 actually posted about the Scene copy earlier. And you said you were not a top user! Hogwash. Its not serious. Im just joking around. Thats good of you to offer but I am determined to make a game with only the web tool. I was tempted to do as you said to insert some sounds as well. But felt it was cheating. If you need to, please go ahead! As long as you use Creator 2.0 to develop, adding sounds and duplicating scenes in one of the native tools is fine. If you can't get sound importing in Creator 2.0, then please go ahead and port it to the native tool and do it there. I'd hate for you to spend a lot of time trying to get it to work when you could take 5 mins and get it done in the native tool. Thanks for offering, but I don't need that. I already have hand-crafted several scenes. Turkey Catch is almost finished I think. When will you say who won? Btw good luck everyone. When will you say who won? Btw good luck everyone. My goal is to have a thread live with the winners by the end of Saturday. It may get posted before that, but that's my goal! 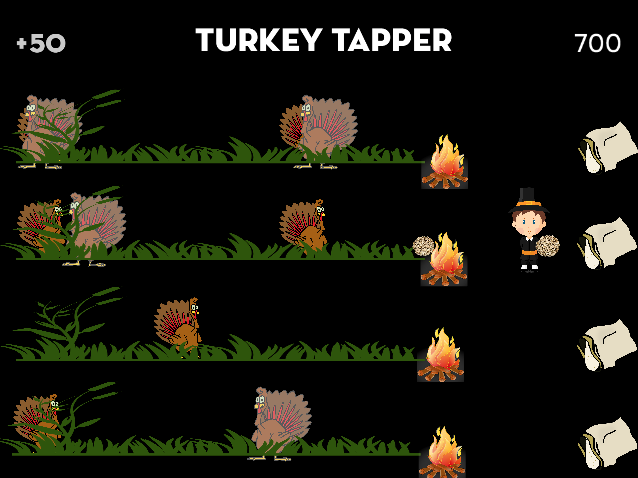 This game is based on a 1983 Midway game called Tapper. Time to feed those turkeys! As the pilgrim, it's your job to make sure no turkeys get harmed. Feed them before they reach the fire but don't overstuff them! I may finish this when the update comes out but after a couple hours of building this using the web tool, I can see the web tool just isn't quite ready for prime time in the current state. It keeps losing my actors. I re-made the score display actor three times before giving up. Same with the scenes. I have a Game Over scene that keeps getting deleted from the project. The time I spent dealing with all that could have been spent making glorious sounds so instead, no sound for you! It seems like the publishing isn't updating because when I play it online, the title and score don't show up at the top of the scene. I'll add a gameplay video in a moment. My sound, (the same one I believe you mentioned,) did not upload correectly. Anyways, here is Anderson Corporation's first game! Turkey Catch! Every level, except for the bonus level, on which you get 125, you get three lives. Enjoy! I totally mis-read the instructions for the jam and somehow missed that the theme was turkeys so this game has absolutely nothing to do with the theme. But since I had it 95% done before I noticed I figured I'd finish anyway. I also had issues with my sounds, I had to remove all of them to get the game to publish, even though they all worked in the web tool just fine. The game is a classic two player tank game, the intention is that it would be a turn based game with each player taking a full move/shoot turn before the other player does anything. This is not built in yet so it's up to the players to play fair. The two players need to be sitting at the same computer and sharing a keyboard. X - Hold down to power up the shot, release to fire. M - Hold down to power up the shot, release to fire. When you said midway 83 I predicted tapper. Thats a great idea! Nice game!